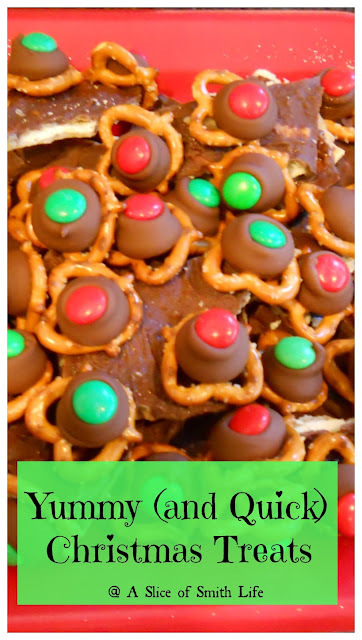 This Advent season I haven't been updating my blog as much as I'd like, but I've been updating my blog's Facebook page, Instagram and Twitter accounts with all the activities we have been doing during Advent. We are continuing to read our Advent read-aloud books by unwrapping one Christmas book each evening under our Advent tree. We are also enjoying the Advent storybook as a family, Ishtar's Odyssey. 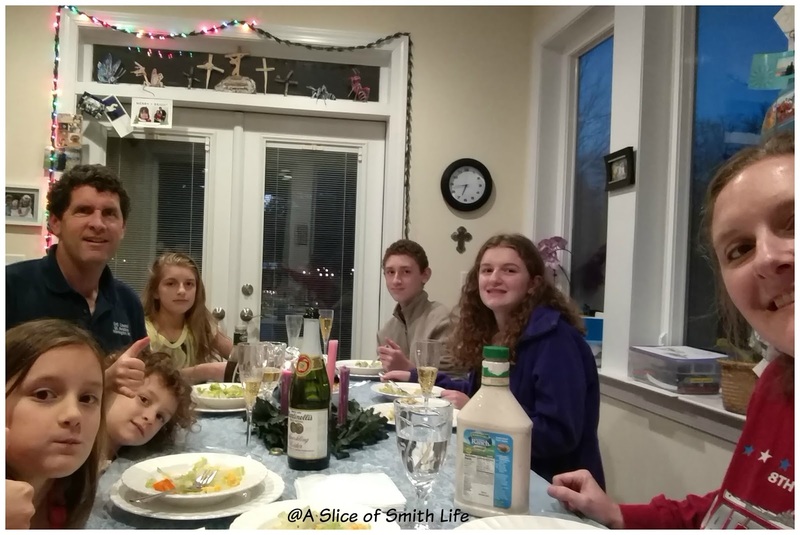 There are many wonderful feast days in the Catholic Church that we celebrate as a family leading up to the celebration of our Savior's birth. 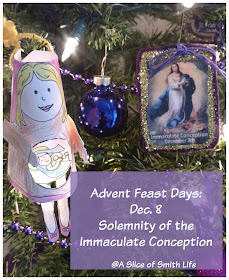 On December 8 each year we celebrate the Solemnity of the Immaculate Conception. Do you know how solemnities, feasts and memorials differ? The Solemnity of the Immaculate Conception is NOT when Jesus was conceived in Mary's womb by the Holy Spirit (Jesus' miraculous conception is celebrated each year on March 25, the Annunciation, which is 9 months before the celebration of His birth on December 25, Christmas Day.) Rather, this solemnity celebrates when Mary was preserved from Original Sin from the moment of her natural conception in Saint Anne's womb. Woah! Heavy stuff, but oh so amazing theology and wonder too! On our Advent tree we hung up the ornament of Mary inside St. Anne's womb that we made a few years ago from Catholic Icing. 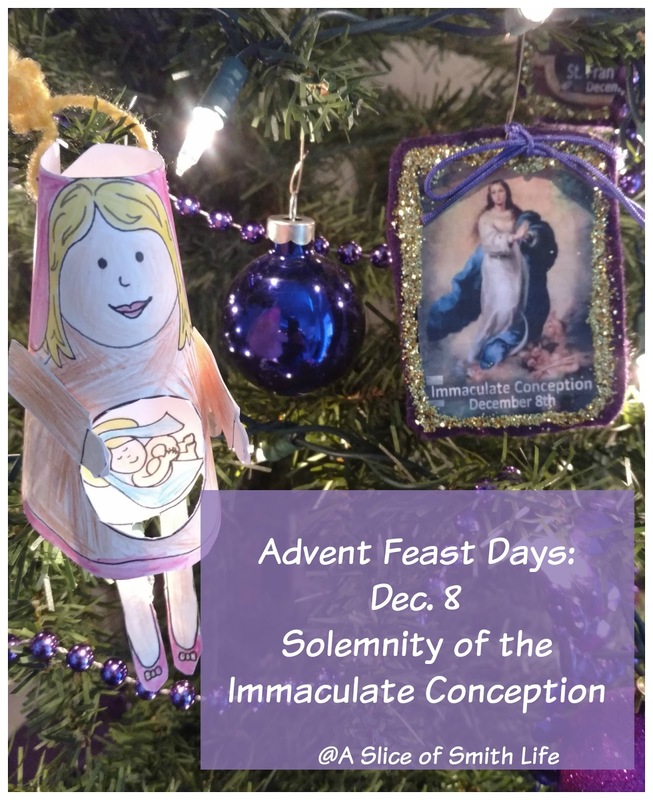 We also hung up our Immaculate Conception Advent ornament that I made a few years ago using Catholic Inspired printables. 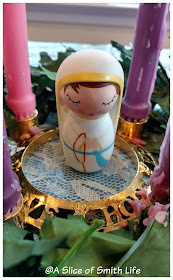 I set up Our Lady of Lourdes Shining Light Doll in the middle of our Advent wreath since it was Our Lady of Lourdes that appeared to St. Bernadette in Lourdes, France in 1858 and our Blessed Mother told young Bernadette, "I am the Immaculate Conception." 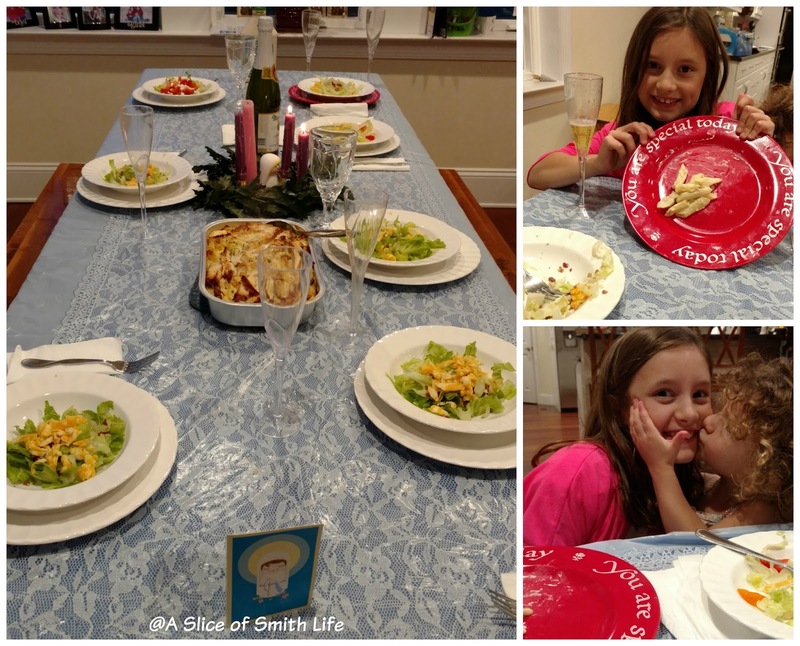 As in years past, we celebrated Mary's immaculate conception, her purity, with a "white dinner" and used our fancy china (that happens to be white) that we got when we got married because Solemnities are a big deal! We had chicken alfredo (from Costco) with salad and Ranch dressing. We drank sparkling cider and for dessert we had vanilla ice cream. 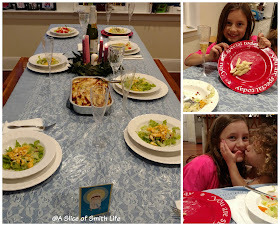 Since my 9 year old daughter has a baptism anniversary on Dec. 9, we also celebrated her baptism during our dinner and she ate off of the "You are Special Today" plate that comes out (when I remember) when our children celebrate their birthdays, Name Days, and baptism anniversaries. 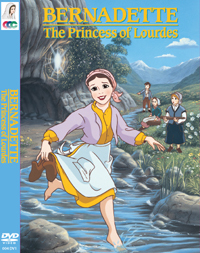 We also watched a favorite CCC of America DVD called Bernadette-The Princess of Lourdes. BERNADETTE, THE PRINCESS OF LOURDES, is the exciting true story of a visit by the Queen of Heaven that left all the world a source of health for body and soul. It was a blessed day!